eWater Systems is pleased to announce that we have been certified by HACCP International. This certification extends the growing list of accreditations for our electrolysis systems as an industry leading hygiene system and as a high performing technology within the food industry. 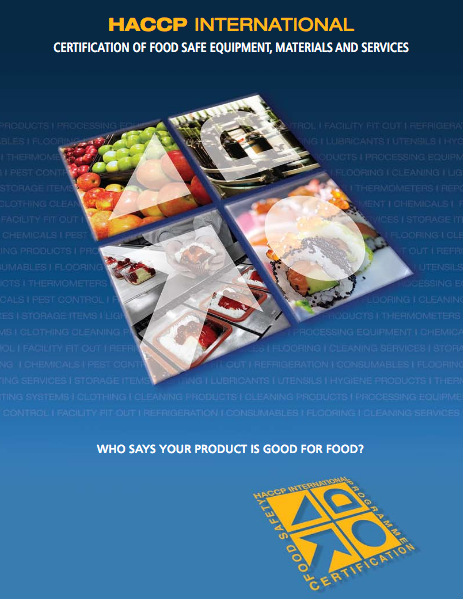 HACCP is a leading certification mark for food safe equipment, materials and services. Respected across Australia along with the wider Asia Pacific region, the HACCP certification provides a recognisable and trusted qualification for specifiers and operators alike in the food industry. eWater Systems has received certification for both their wall mounted model and their fully reticulated systems as generators of food-safe cleaning and sanitising liquids, suitable for use in food facilities and food handling operations. This certificate reiterates our client’s confidence that they are using an industry leading hygiene system in their food operations. To achieve the HACCP certification both a practical and scientific audit of both products has been completed to validate their compatibility with HACCP based food safety programmes and their contribution to food safety. This process included examination of the design, manufacture, materials, instructions, delivery, storage, accuracy, labelling, food safety claims and any other relevant food safety matters. Offering sustainable hygiene systems using salt water electrolysis technology, eWater Systems are helping businesses safely replace harmful chemicals at a lower cost, with zero impact on the environment. The simple, safe and effective nature of electrolysed salt water, provides an elegant solution to a complex problem, and the addition of the HACCP certification provides another layer of evidence to the performance of this technology within the food industry. eWater Systems can be found in over 350 leading Australian businesses, many are iconic sites such as the Royal Children’s Hospital, the International Convention Centre in Sydney and Australian Parliament House. For more information about the certification, see the HACCP website. For further information about eWater Systems or our HACCP certifications please send us a message using the form below.